Is Your Visual ID Card System Really Secure? Secure ID cards…Are you sure? When creating an ID card, aspects such as colour, design and layout can sometimes take priority over the most important element, the security. Without a robust card security feature, anyone with access to any ID card printer could make a convincing copy of your card. All Magicard manufactured ID card printers have a built-in card security feature – HoloKote, this exclusive technology prints a secure watermark as part of the normal print cycle and at no extra cost per card. The Magicard Rio Pro printer enables you to add a further degree of security to your ID cards by personalising this secure watermark to your own logo or security design. The typical purpose of an ID card is to verify the holder of the card’s identity and their authorisation to be in a particular location. The threat to the public is the malicious production of counterfeit ID cards. There are many highly sophisticated and effective security products and measures available to address security breaches due to “fake” IDs. However, many real world ID card applications are rudimentary ‘badging systems’ and do not implement any additional security at all due to the expense and complexity of secure solutions such as holograms or embedded technology card systems. 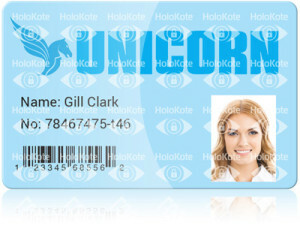 This requirement for an affordable secure ID card feature inspired Magicard’s innovative and patented HoloKote technology. The HoloKote image is frosted into the clear overcoat panel of the standard print process resulting in a watermark like layer that can be visually verified when the card is tilted in the light. With all Magicard manufactured printers, the user can select from standard secure HoloKote designs using the printer driver. For a small one-off cost, an organisation can request its personalised Custom HoloKote from Magicard. Custom HoloKotes can only be generated by Magicard and a secure database of all designs created is kept to prevent counterfeiting and fraud. For the Magicard Rio Pro, a Custom HoloKote activation kit consists of a CD containing the customised design and a unique RFID card that inserts into a special slot in the printer. Without the secure RFID card, the watermark will not be printed. This innovative security option is available by special order and the short lead time makes it possible for customers to start producing secure ID cards in far less time than is required by a custom holographic overlaminate solution, and at a fraction of the cost. 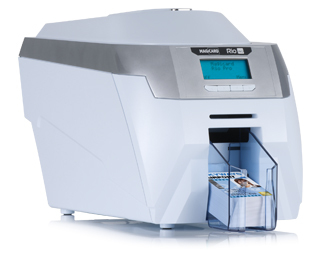 For more information on HoloKote or any Magicard ID card printer, contact our regional offices.